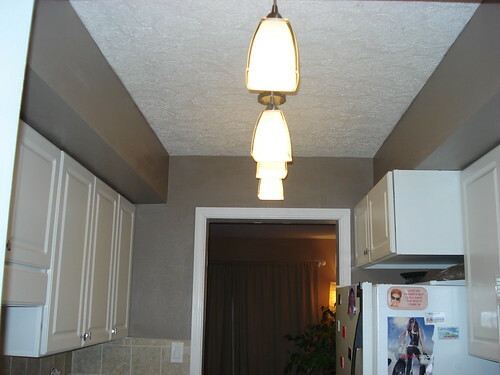 I had all intentions of starting and finishing my kitchen ceiling back in April when I began to tear it apart. It had 4 florscent bulbs under a drop plexiglass ceiling. So ugly. As I started to dismantle everything, I discovered that the wires were literally just hanging down into the ceiling. No housing unit. Is that up to code?! I’ve done some basic rewiring in other rooms, but this was way over my head. Plus since the ceiling was hidden, it was unfinished, so I would have to figure out how to get it stomped like the rest of the house. Hault the project until I could find someone with the skills necessary. Enter Jason! I’d seen his work at a local establishment I visit from time to time, so I asked him if my ceiling sounded like something he was interested in. He stopped by a few days later. His quote was right in my price range. We have a deal! I knew exactly what I wanted. 4 drop pendants straight down the center of the ceiling. 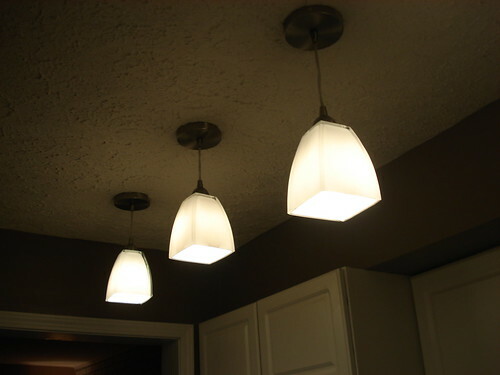 I had purchased a few different styles but settled on a stainless steel pendant line with a flared square white glass shade. Tonight I painted the now exposed side walls, and voila! Jason does good work if you ever have some home repair you need done! Now, on to the bathroom fan. Let’s see if I can accomplish that on my own in less than 7 months. My aquarium light went out about a week ago. The housing unit on it was shot. The ends were flimsy and the bulb no longer sat firm in the sockets. Even the piece that held it on the lid was covered in duct tape. I adopted this aquarium from my parents when I downsized my 125 gallon to this 55, and they upsized this 55 to a real koi pond at their house. I started researching hood lights and was finding new pieces from $40-$100. I’m ready to sell this tank because now, I want to upgrade to a new one I’ve seen. I wasn’t in the mood to spend any money to fix it, so I let the creative juices kick in. About 3 days ago I realized, the pieces I needed were actually in my kitchen! I’ve been waiting to redo the kitchen anyway, so this would be my kick start to that project. So, I flipped the circuit off, climbed up my counters, and disassembled 2 of my florescent lights for parts. I removed the entire old light housing from the tank lid and got the wires off. With a little gorilla glue ($4.50) and some electrical tape ($0.60), TA-DAH! I took a week break from the manual labor scene, but decide my next home improvement project was going to be my front door. Living in a condo, you have little options, but i’ve surveyed the community and found a few I liked. I’ve been waiting for some Sunday sales and Lowe’s finally had a decent looking storm door in the paper for $100. Sweet. I went over to check it out. Once I got there, I quickly realized this was low end in the product line and could practically pick it up with one hand. Crap. I’m in the mood, ready to buy, alright, give the deluxe model. The Lowe’s guy and I got it to my car to realize it barely fit. I literally had to sit under it while driving home. I called up Papa Rick to see if he some time this week to help me out. Just like a good friend, he gave up a few hours last night to help out. I did my homework the night before by taking off the old door. Once I took it off, I realized I didn’t take a picture! Doah! Here it is in the trash. Rick came over and the box says “6 easy steps”. Not sure who did the advertising on that because the directions clearly had over 20 steps. It took us about 2 hours, 10 shims, 1 broken drill bit, but we got it. Here’s the final product. I love it! Thank you so much Rick for helping me! I realized I lived with the other one for so long because I never had to look at it. All my neighbors did but not me. While Rick and I were admiring our work, I said “It’s so pretty!” and my neighbor happened to be outside and she agreed. I told her I did it all for her. P.S. Yes, I blurred out my address. Didn’t want to invite any unneeded stalkers to my doorstep. EDIT: Forgot to mention my dream connected to this story. Kyle and I were on vacation and ready to pack up the car to go home. No clue where we were, but I told him to go get the car and I’d get the luggage down the stairs. Instead of carrying it down, I went to a different hotel room door, took it off the hinges, and started carrying it out. I didn’t notice that people were in there sleeping until Matthew Lillard (a.k.a. Shaggy or creepy Scream movie dude) started chasing me down the hallway in his boxers while I’m running with the door over my head. I woke up before he could get me. Week 1 – First order of business was peeling wallpaper. This paper did not want to come off! It had been on there since 1982. The first round of gel didn’t even make a dent. So, I reverted to steaming the top layer off with an iron then using gel on the remaining layer. Once Kyle finished installing new flat switches and outlets, he got on the steam train and it went much quicker with 2 of us. 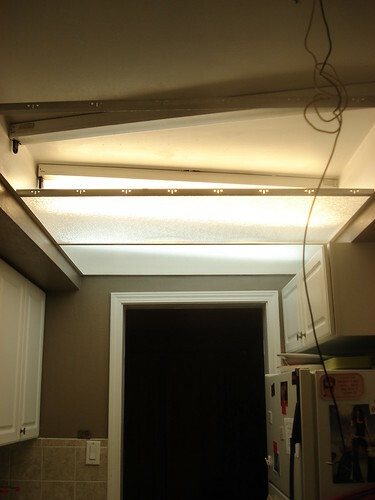 During this week, we were also able to put a new light above the table, take down the old blinds and prime the walls. Here is an action shot. Week 2 – Kyle is a bit adverse to color. He likes white, beige, neutral. I say “blah blah blah” to those colors. When I redid my condo, I went way too light upstairs and learned my lesson to try some bold colors when I redid my downstairs. Kyle had picked out a light gray. I vetoed that. After some negotiations we ended up with Charcoal Seal Gray. If you ask Kyle, he’ll say it’s purple. I disagree… maybe there’s a tinge of a tiny hint of purple. We put a coat of white on the trim and windows to freshen up the look and added white wood blinds. I put together a decorating budget of $350 and took Kyle to all my favorite discount stores to get vases, baskets, rugs, art…. And my favorite, a new stainless steel trash can. His trash can was so bad I didn’t even want to put trash in it. My last order of business was to scrub the floor. With a bristle brush, my Barkeepers friend powder and a bucket of water, I spent 5 hours scrubbing 50 square feet of linoleum. At this point I had kicked Kyle out of the kitchen and slap-happy set in. This is when I became Cinderella and starting complaining about my Wicked Step Boyfriend and the work he made me do. Instead of getting a glass slipper at the end, I got a glass of Jack. Tomato… Tamato… Here’s the finished product. A few things are still left to be done, but the budget has been exhausted. New countertops and cabinet pulls will come soon. We are debating staining the cabinets from the 80s brown to a cherry finish. What’s your vote? I’m always looking for some new way to spice up my condo. Problem is projects cost money and money doesn’t grow on trees! I redid my downstairs bathroom on my sabbatical last year. For a mere $400, I stripped the wallpaper, textured and painted the walls, added some new accessories and a faucet… brand new bathroom! Here’s the finished product. Of course, I didn’t take a before picture but let me tell you, it was boring tan wallpaper with a leaf boarder. How I lived with it for 5 years… I have no idea. My next big project is the florescent lights in 3 of my rooms. I’ve only rewired my light switches and tried to wire a fan… I’ll need to leave that job to someone else. What next? I’ve been trying to warm up the master bedroom and was toying with new paint or new bedspread. It’s hard to put money down for new stuff when your old stuff is still good, but I’m just tired of it. And speaking of tired, I’m getting old and don’t sleep well these days. My windows face directly west and it’s a flood of sunshine bright and early. So I combined this need for more shade with my attempt to updated the master. I already shelled out money for expensive dual motion cellular shades when I bought the place… what could I come up with? Before…. Mission accomplished for $60. I have great deep window seat ledges in some rooms. I didn’t want to lose that, so I opted for shower curtain rods that extend to the width you need. I pushed them all the way back to the current shade and added chocolate textured panels that block 99% of the light. I pinned them to a length so they pool nicely on the ledge, and presto… I got exactly what I wanted! Too bad I don’t get to sleep in until Sunday this week!